Even if she had not become immortal by playing Scarlett O’Hara in Gone with the Wind (1939), Vivien Leigh was destined to become a great actress. Not only was she bitten by the acting bug earlier than most, but she had a passion for performing that burned so brightly it gave light to those who were fortunate enough to share the screen or stage with her. Sadly, the lights which burn the brightest also burn the fastest, and Vivien was taken much too soon. Vivien’s parents were members of the British Raj in India when she was born in Darjeeling, 1913. At the age of three she was given a chance to recite “Little Bo Peep” before her mother’s amateur theater group, and she was hooked on acting at that moment. Her mother also played a memory game with her that they learned from Kipling’s novel Kim, where Vivien was allowed to look at items on a tray and then had to recall them after they were removed. In later years, she was able to memorize her line after one or two read-throughs. When Vivien was six, her mother sent her to a convent school in London. Since she was two years younger than the other girls her closest companions were a cat who lived in the courtyard and another outsider, a pretty girl from Ireland named Maureen O’Sullivan. The girls colored each other’s bleak existence at the convent by telling each other tales of places they have seen, places they wish to visit and dreams of their future. Maureen is less focused than Vivien (at nine, Maureen was determined to be an airplane pilot) but it was always acting for Vivien. Maureen would also have a storied movie career, appearing as Jane with Johnny Weissmuller in the Tarzan series. When she went to see one of Maureen’s early films in London with her parents, she finally shared her dreams of acting with them, and her father enrolled her in The Royal Academy of Dramatic Art. Her attention and ambition wavered when she met and fell in love with a barrister, Leigh Holman, who was 13 years older than she. She was just 19 when she married Holman, and had a daughter ten months later. A friend suggested that she try for a part as a schoolgirl in Things Are Looking Up (1935). Although it was a small, uncredited part, she engaged and agent and began working on improving her acting. In 1936, she and a friend went to see a play starring Lawrence Olivier. When she saw the handsome actor on stage, she whispered to her friend “That is the man I am going to marry”, and she was undeterred when her friend pointed out that she was already married, and so was Olivier! Olivier and Leigh began an affair while filming Fire Over England (1937). About the same time, Vivien read a new novel by American Margaret Mitchell and set her cap for playing the role of Scarlett when the book was inevitably brought to the screen. She and Olivier began living together while appearing in Hamlet at the Old Vic Theatre, despite the fact that neither had been granted a divorce. When Olivier was offered the role of Heathcliff in MGM’s Wuthering Heights (1939), Vivien was offered a secondary role which she refused, insisting she would play Cathy, the lead, or not at all. Because she was too inexperienced and unknown in America, the producers rejected her, but by then the furor over the search for an actress to play Scarlett O’Hara was reaching a fever pitch. David O. Selznick of MGM bought the rights to the Pulitzer Prize winning novel Gone with the Wind and launched a highly publicized search for a star to play Scarlett. Vivien’s agent was a London representative for a talent agency belonging to Selznick’s brother Myron and arranged an introduction. Myron had seen her early films, and was sure she was “too British”, but when they met in Hollywood he became convinced she was the Scarlett his brother was looking for. Filming Gone with the Wind became an ordeal for Vivien. She was in almost every scene, and worked 16 hour days, six days a week, for 125 days. She was paid $25,000 for her work on the film. Clark Gable was paid $120,000, but only had to report to the set for 71 of those days. After winning the Oscar for Scarlett, Vivien set her sights on costarring with Olivier in Alfred Hitchcock’s Rebecca (1940). The character of Mrs. de Winter was timid and weak, and no one, including Olivier, thought she could pull it off. 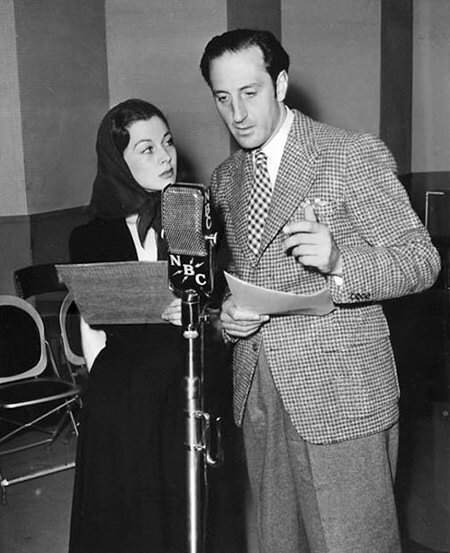 However, she did play the role with Olivier in the Lux Radio Theatre production. Her screen test can be seen here. 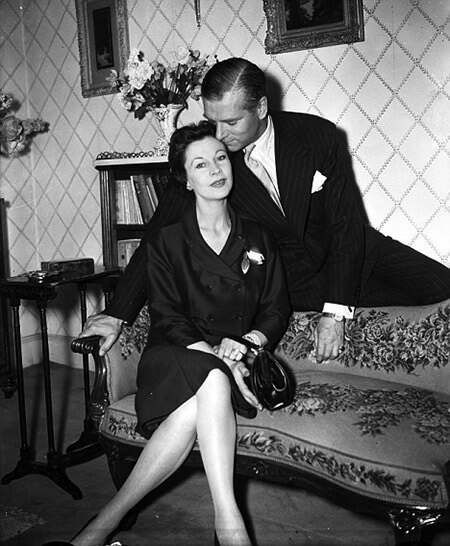 Olivier and Leigh were finally granted divorces from their first spouses in February 1940, and became man and wife on August 31, 1940. While on a troop morale-boosting tour of North Africa, Vivien developed a persistent cough and was eventually diagnosed with tuberculosis (she had been a heavy smoker during the filming of Gone with the Wind to deal with the stress of the shoot). 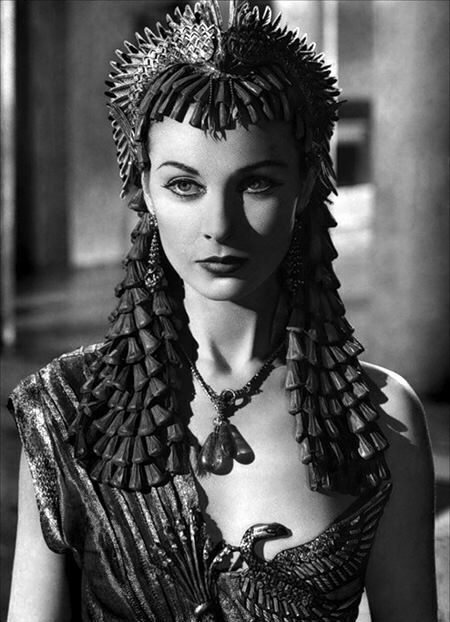 After she had recovered, she began filming Caesar and Cleopatra (1945) while pregnant with Olivier’s child. She slipped while running across a polished floor in a scene and miscarried. This put her into a mental breakdown which was part of what would later be diagnosed as bipolar disorder. A Star on the Hollywood Walk of Fame at 6773 Hollywood Blvd honors Vivien Leigh’s contributions to the Motion Picture Industry. Hers is the only Star at that location. 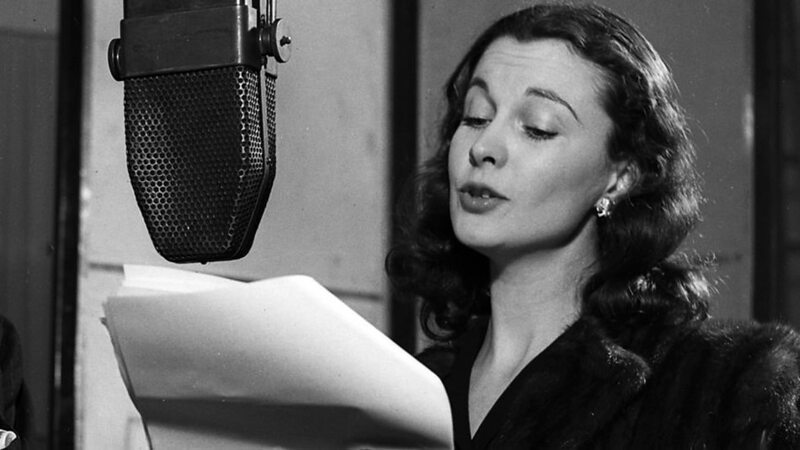 Be the first to comment on "Vivien Leigh"